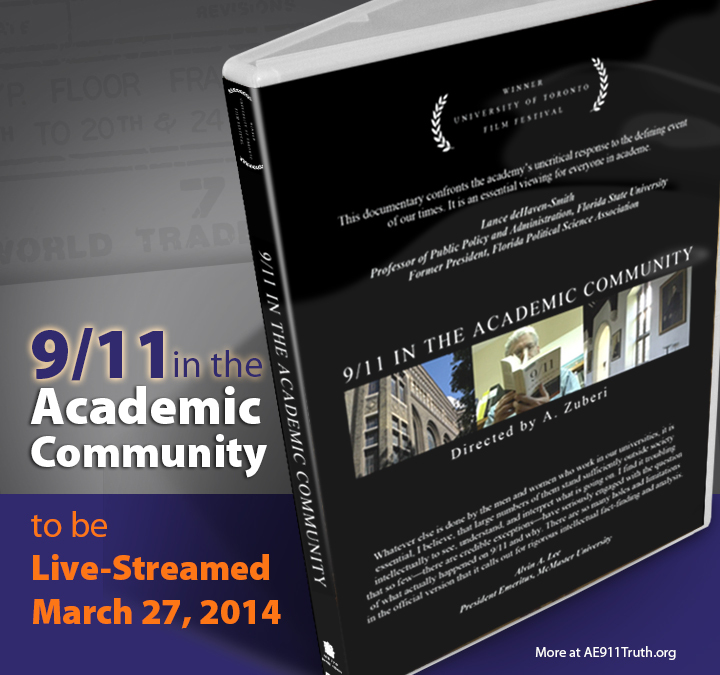 The Northern California 9/11 Truth Alliance will be showing the critically acclaimed, recently released documentary, “9/11 in the Academic Community” on Thursday, March 27, 2014 at 7pm in Berkeley, California. The event can be viewed simultaneously online, via internet live-streaming from Pacifica affiliate, NoLiesRadio.org. For more information go to SF911Truth.org. The film documents how the taboo against skepticism includes the 9/11 Commission Report. The film features Michael Truscello from Mount Royal University, Calgary, Canada, who points out that 25% of the footnotes to the 9/11 Commission Report were based on testimony obtained by torture, an astonishing fact, given the well-known unreliability of information obtained in this way. In “9/11 in the Academic Community” academics reveal what it is like to experience the stigma, the social pressure, and the career repercussions of standing up for truth. Co-sponsors for this screening with the Northern California 9-11 Truth Alliance are Project Censored, No Lies Radio, Architects & Engineers for 9/11 Truth, and the Social Justice Committee of the Berkeley Fellowship of Unitarian Universalists.